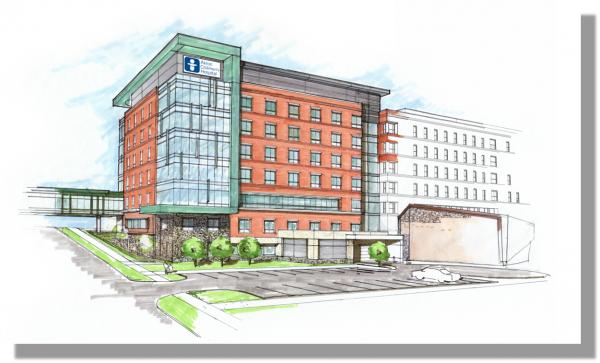 In March 2017, Akron Children’s Hospital will break ground on a 230,000-square-foot addition to the Considine Professional Building. ing designed to be more flexible, collegial and diverse. “Our vision is to design a family-friendly space that supports the delivery of care in an environment that providers and staff are happy to work in,” said Grace Wakulchik, chief operating officer. The expansion project will nearly double the existing square footage of the building, and total 480,000 square feet when it’s complete. While a number of departments will move into the new addition, the project will also help meet the growing need for more space in the NeuroDevelopmental Science Center and Sports Medicine. In addition, the outpatient laboratory from the Locust Professional Building will be combined with the building’s existing outpatient laboratory into a larger, renovated space. The building will also feature amenities for families including a café. Another major improvement is the extension of the connector from the Kay Jewelers Pavilion to the main hospital building to the expanded Considine Professional Building. This will improve wayfinding and provide a consistent, modern architectural design for the campus. Planning for the Considine addition began in early 2016, and the design team is building on the Lean principles we used for the Kay Jewelers Pavilion and the new building on our Beeghly campus. That includes Lean boot camps and workshops with departments, cardboard mock-ups to test workflows, and parent participation in the design process. The team is designing universal exam rooms flexible enough to adapt over time depending on clinic volumes and healthcare trends. The space is divided into in-clinic and out-of-clinic space that will support improved processes and workflows for staff as well as increased safety and better wayfinding for patients. Perhaps the biggest change is centralized check-in and registration. The process is future forward. For example, consider how airline check-in has changed over the years – where large counter spaces were once needed, passengers can now check in from kiosks or even on their smart phones. The new clinic check-in model will be more flexible over time and allow for new technology to be introduced. It will also allow for faster access to services like interpreters, financial counselors, as well as, wheelchairs and wagons.